Instant adhesives for joining difficult-to-bond plastics, filling gaps, and assembling medical devices have been formulated to withstand service temperatures as high as 120°C. 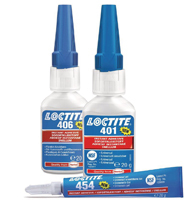 Available in a variety of viscosities, these Loctite 401, 406, and 454 adhesives are able to fix almost any assembly material in less than 5 sec. The first adhesive is an all-purpose product suited for bonding rubber, plastics, metals, porous materials, and acidic substrates. The second is a clear, transparent adhesive that is good for bonding rubber, plastics, and elastomers. When used with a primer, it is suitable for polyethylene, polypropylene, and PTFE substrates. The third is a general-purpose bonding gel that does not drip. Existing dispensing equipment will accommodate these instant-bonding adhesives.